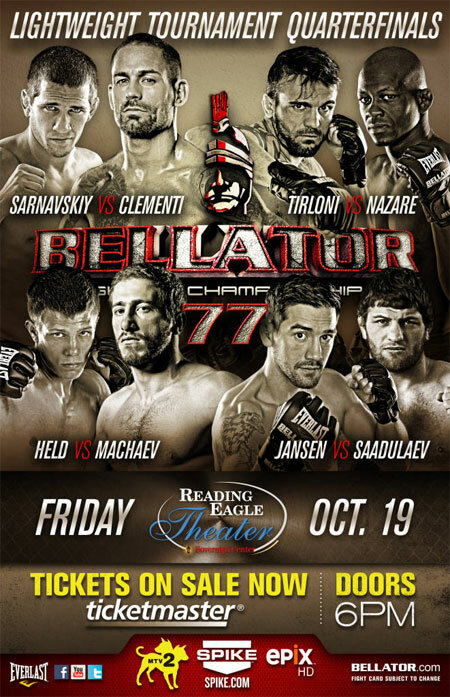 “Bellator 77” takes place Friday inside Reading Eagle Theater in Pennsylvania. Tonight’s show features all four quarterfinal lightweight tournament matchups. SpikeTV.com will stream the night’s prelims live beginning at 6:30PT ET/3:30PM PT. MTV2 broadcasts the featured fights at 8PM ET/PT. However, fight fans can also stream the entire event live right HERE on 5thRound.com. Brett Martinez Defeated Eric Albright via Submission (Guillotine Choke) at 3:28 in the 2ndRound.